Welcome! This web site reports since 1997 on mass customization, personalization, customer integration, and open innovation -- strategies to co-create value between companies and customers. It supplements my blog on these topics. It is edited by Frank Piller, RWTH Aachen and MIT Smart Customization Group. Most information here is in English, but some links also refer to German texts. If you find that some information is missing, please contact me for any hints or further questions. For an introduction into mass customization & open innovation in form of some brief articles, head here. Glossary: What is mass customization, open innovation, and customer integration? The largest database of online configuration toolkits. More than 500 online configurators from all industries (external link to our cooperation partner cyledge). Creating value by integrating customers with mass customization and open innovation strategies is a fascinating topic for conferences and workshops on corporate strategy, innovation, marketing, and relationship management [ More information]. Mass Matching: The MCPC 2009 Conference. The MCPC conference series is THE event of the international mass customization community. The 2009 conference is over, but you still can browse the conference site. Jarmo I. Suominen, Frank T. Piller, Mitchell Tseng (Editors): Mass Matching. Proceedings of the MCPC 2009 World Conference on Mass Customization & Personalization. October 4-8, 2009 at Aalto University, Helsinki, Finland. Proceedings will be published soon. Extreme Customization: Full Text Proceedings of the MCPC 2007 Conference at MIT. The conference is over, but you still can order the conference proceedings. 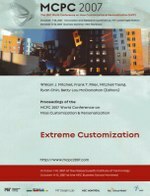 William J. Mitchell, Frank T. Piller, Mitchell Tseng, Ryan Chin, Betty Lou McClanahan (Editors): Extreme Customization. Proceedings of the MCPC 2007 World Conference on Mass Customization & Personalization. October 7-9, 2007 at the Massachusetts Institute of Technology. More information. Interaktive Wertschöpfung: Our GERMAN textbook providing a combining theory of customer co-creation, open innovation and mass customization. Download the book here (in German language). 2nd edition 2009. Interaktive Wertschöpfung. Open Innovation, Individualisierung und neue Formen der Arbeitsteilung. von Ralf Reichwald und Frank Piller unter Mitarbeit von Christoph Ihl und Sascha Seifert, Gabler Verlag Wiesbaden, 2. Auflage, 2009. Mehr Information And: The book in the press & blogs. This news feed is published by Frank Piller under a "Creative Commons Attribution-ShareAlike License". Some rights reserved. ( More information on this license and your rights to use material from this web site). Back issues : Read all past issues of the newsletter here. This newsletter is published as a web blog. To get all news immedeatly, subscribe the RSS newsfeed (you need a news reader to read this format). Every 4 or 6 months, I will also e-mail a summary of the last posts to all e-mail subscribers (right). The following press reports provide a good introduction into mass customization and open innovation. More recent press coverage can be found here. An interview with Eric von Hippel, MIT, on Democratizing Innovation. MC&OI Blog 2005 . Download. This web site is published under a "Creative Commons Attribution-ShareAlike License". Some rights reserved. (More information on this license and your rights to use material from this web site).